Here we are, in booth 1551. Left to right myself and David Young. (Typo corrected: original said Arlene Young in the middle; I was thinking of a different photo). David was selling his books and I was selling my Second Amendent documentary. 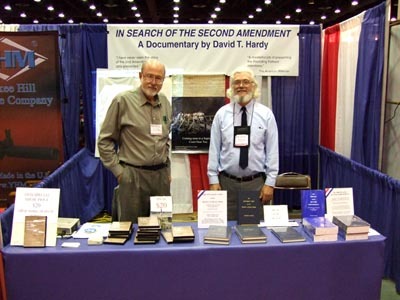 Continue reading "David Young and I at NRA convention"
"In Search of the Second Amendment" shows on the big screen tommorrow, Saturday, at 10 AM, at the Backlot Film Festival. It's in Culver City, west end of Los Angeles. My documentary film (if you want one, see the left margin) will air at the Backlot Film Festival in Culver City CA (west part of L.A.) this Saturday at 10 AM. Tickets are only $5, and if you're in that area, I'd encourage you to attend. There's a chance the media will pick it up, and that increases if there is a sizeable attendance. Film festival to show "In Search of the Second Amendment"!! My documentary (you can order from the ad in the left margin), "In Search of the Second Amendment," has been selected to show at the Backlot Film Festival in Los Angeles. Festival date is April 2-5, I don't have a specific date and time for my screening. Also showing will be "Lady Magdalene's," by libertarian filmmaker and author J. Neil Schulman. It's a drama/comedy that is pro-gun, and features his composition "I'd rather be tried by twelve than carried by six," which is one heck of a melody. "In Search of the Second Amendment" will have its screen premiere in Twin Falls, ID, on October 3 and 4. Courtesy of Red's Trading Post. Historian Clayton Cramer (as in the fellow who brought down Michael Bellesiles) will be there to speak and promote his recent book. I've been trying to promote In Search of the Second Amendment, but have been pretty swamped lately. David Codrea has a couple of interesting suggestions for anyone interested. If you have a Netflix or Blockbuster account, he has webpages where you can suggest that they stock it. (Commenters suggest that doing a search on Netflix for it will also start to trigger their software/thinking). He also suggests requests to public & university libraries to carry it. I've got seven clips posted (in addition to the original trailer) over at YouTube. The new clips concern: the 14th Amendment, arms in the civil rights movement, and a city/police agency has no legal duty to protect you. Posted two more on Youtube. Going to create and post a few more later this week. (Note that the video transitions are grainy, because of the degree to which YouTube compresses the video). Mike Westfall interviewed me about In Search of the Second Amendment, and the Canada Free Press picked up the story. Mike's interview is here. The surge from the documentary's favorable reviews in The American Rifleman, America's First Freedom, and Gun Week seems to be wearing off. I'm open to ideas on how to further promote the DVD, if anybody has some. Just in case someone wonders "what documentary?" here's its webpage. Documentary on Second Amendment hits HotAir! In Search of the Second Amendment just got covered on Michelle Malkin's popular videoblog, HotAir! I'm doing a daylong (ok, part time) interview online at David Codrea's War on Guns. A local radio host, Charles Heller, just posted a radio interview about my documentary film. My 2nd Amendment documentary DVD now has a detailed Wikipedia page. courtesy of viewer Eric Salem, outlining its content. (If anyone wants to order, see the link in the left margin of this blog page). Shipped out the 500th copy of the documentary today. It's going slower than expected, but I'm not complaining. Got the first shipment of DVDs in yesterday, and sent first shipment out at 8:30 this morning, covering all that had come in by then. Whew! It was a 30+ minute wait to get to the head of the line. (The postal meter equipment comes in today, and when I get it set up things will be much easier). The first load was of about 20 of them (I didn't stop to count). You can order here. Actually, this is the easy part. I've got an ad coming out in America's First Freedom, probably hits on Monday, and that's gonna lead to a big surge. But by then I'll have 5,000 on hand, probably 500 of them already in envelopes, so it should be do-able with a lot of work. I'd planned to have them in hand 3 weeks before the ad hit, so I'd have time to start internet movement, give the systems I've created time for testing, etc. But the firm creating the DVDs had a problem -- that I had to diagnose -- the software used for video compression at certain points made video transitions rather blocky. Diagnosing and fixing that took the 3 weeks. So I've only had a day to work out kinks in the system, such as.... the label-creating software is a mediocre port for the Mac, and wouldn't cut and paste. Nor will it allow a template to be created in Word. It took hours to find a way around that, but now I think the assembly line is working, as it were. BTW, I'm very pleased with the job they did on it. The cover, and DVD art, are great, and with this encoding all of the transitions went very smoothly, no blockiness. Documentary about to become available! No blogging today, since I spent 7 hours in a settlement conference for a firearms dealer whose inventory was seized by ATF, dropped into plastic garbage cans, and trucked away. My first suit got the firearms back, and this second one ended with a hefty settlement for damages to the guns. But I have the honor (roll of drums) to announce that the documentary is on its way here. The first 500 should arrive tommorrow (Friday) by 2nd day UPS, and the remaining 4500 on Monday. I should be able to start shipping Saturday, or maybe Friday if they come early and I get some legal housecleaning done in time. The distribution website is here. I put the trailer on Youtube here. I gather the DVD producer is starting work. Finally got it compressed just right. (Mapping out a DVD is NOT a simple task. The movie is split into video and audio, each is compressed separately (mpeg-2 for the video, Dolby for audio), then they're rejoined, and divided up into segments. The production house's mpeg-2 compressor wasn't quite up to the task. After much investigation, I got a better one, and compressed it myself, then shipped it to them. Yesterday I reviewed the resulting DVD, and it was up to snuff). Will probably be working tonight on the internet store. Reviewing sample DVD, and so far it looks good. I had to recompress the footage (the compressor used by the studio wasn't quite up to what was required), but it looks as this is a go. I'm not going to be doing much blogging today ... working on the documentary. It should have been done, but -- the firm that is doing the creation sent me a draft DVD about two weeks ago, and it had some video glitches. Nothing that prevented the message from being relayed, and I suspect most viewers wouldn't even see them, but I could. So I got back to them. I and have waited for two weeks, sending emails and calls during the time, asking what in the heck is up. In the meantime, I'm experimenting with encoding it myself -- but each run ties down the fast computer, which is much easier to use for blogging, for about three hours! 1. Editing is pretty good and keeps the story moving. My one concern is with the English right. It's very hard to pep up 17th century legal evolutions! I chopped it to the minimum, maybe 12 minutes, and tried to keep it going. Could always have added pikemen and musketeers but that would have cost several thousand and, as I had zero assistance and zero budget at that stage, it couldn't be done. I got some nice images and used those in place of moving footage. I figure 12 minutes of slow moving isn't going to hurt. I couldn't cut it, because I wanted to illustrate that the American right did not just spring out of nowhere, or just out of conflicts with redcoats after 1768. The rest of the film is pretty lively. It had to keep moving! There's so much ground to cover in short time. When your history spans from Charles I to the civil rights movement, you have your work cut out for you! When I get time I'm going to transcribe the latter. I got a couple of former civil rights workers (Don Kates and Joe Olson) to carry that end, talking about how they packed guns, how almost every civil rights worker they knew did so, and how they used them to ward off the Klan (Joe said protocol was this: on a lonely road, a truck pulls up right to your back bumper, high beams on. You know what that means. You take your handgun, put it in your left hand, and lean it out the window, pointed up, wave it slowly back and forth. The vehicle behind you suddenly slows, falls back, and turns around. This was not the civil rights worker they wanted to tangle with. Then I go into Robert Williams' book on his experience, where his chapter of NAACP got itself chartered as an NRA club, and started ordering in rifles, and wound up shooting up a Klan attack. From there to re-enactment of a case where the Lumbee Indians, with their weapons, broke up a Klan cross-burning and ruined the Klan in their area (local officials charged the Klan leader with inciting them to riot and sent him to prison. Amusingly, the judge noted that perhaps the Lumbees were not without fault, but none could be identified. It's amusing because reporters had photographed them at close range and the pictures were in local and national media! I suspect the judge and spectators were chuckling as he spoke). 2. A reader was concerned the first run would be 5000 DVDs... might that be suddenly wiped out, and will there be arrangements for pre-ordering? I'm one of those fellows who is VERY loathe to make a promise until he is certain he can fulfil it. I figure to set up pre-ordering maybe a week or ten days before the DVDs arrive. By then I should know everything has tested out, the reproduction is mostly complete, and have a very good idea of when things will arrive. I think my distribution system should insure against wiping out the inventory. a. Starting in mid or late November with 5000, slowly begin promotion. Note it here, of course, maybe hope for some internet chatter. Follow with articles in quick-turnabout gun journals such as Shotgun News. If this moves 500-1000 or so (the first number probably more realistic), invest that in another order for 5000 or even 10,000, which should arrive in 1-2 weeks. b. In mid-December, run the first ad in a major gun magazine. (These have to be scheduled 2 months in advance, so take out a loan for it). At that point, 3-4 weeks after first availability, I hope for the first big demand. c. IF that turns out big, order more and follow with advertising in multiple gun magazines in, say, March-April. (The two month requirement makes the gap in time necessary). UPDATE: Thanks for the ideas. I'm writing up flyers, etc. in my spare time. And text for an internet store page. I'm in contact with a fellow here who designs and runs internet stores. I suspect that, what with having to fit this around other work which has to take higher priority, this will take about ten days. That should put everything in place maybe a week before the DVDs are done. UPDATE, I have the film done and am distributing ... : you can order, and see the trailer on Youtube by going to the link below. I've got a webpage for it here. Blogging will be a little slow today, since I'm working on a law review article and on polishing the Second Amendment documentary film. I hope to have it in distribution by end of September. I've got a clip (warning 19 megs of video) posted here. Right now the length is an hour and 48 minutes. I've got everyone from Joyce Malcolm to Gary Kleck in it -- Nelson Lund, Gene Volokh, Glenn Reynolds, Brannon Denning, Dan Polsby, Don Kates, Steve Halbrook, Dave Kopel, Clayton Cramer, and others I'm too tired to recall.